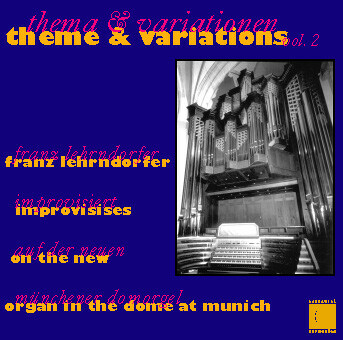 On this recording Franz Lehrndorfer presents the new organ of St. Marys Cathedral in Munich to a larger public. His choice of the improvisational form allows for much greater freedom of registration than in the performance of the organ literature and for a better demonstration of the instruments sound spectrum. The new instrument resounds throughout the cathedral, displaying a vast wealth of color and ranging in volume from a gauzy pianissimo to an overwhelming tutti. Lehrndorfer chose a number of different forms for the five improvisations featured on this CD. Church musician that he is, he could of course hardly do without the two wellknown hymn themes Maria, breit den Mantel aus and Großer Gott, wir loben dich. They reflect his special relation to the hymn form, and his improvisations on them are structured as variations with a concluding fugue. The second piece, a meditation with freely invented themes and a concluding fugue on the Ite, missa est, would fit very well within the framework of the mass: the meditation during the communion and as a hymn of thanksgiving and the fugue for the recessional. Here Lehrndorfer demonstrates how organ music of high musical standards may also serve a religous function within the liturgy. The interesting music of the Intermezzo develops from the tone D which forms its musical center and is initially encircled by semitones. The circles increase in diameter, and clusters of tones surround the center. The same tone is always the point of departure for each new sequence. The whole takes on increasing dimensions, and a magnificent sound structure is the acoustical result. The music goes as it had come and in doing so forms a balanced overall tonal architecture. The improvisation with the concluding Easter Alleluia pays tribute to the cathedral organs symphonic character. Here too Lehrndorfer is in his element. He has the staying power for presenting largescale formal designs as self contained units. Even though Lehrndorfers improvisational style has developed in the direction of modernity over the decades, his own special touch has continued to manifest itself in all his efforts. In sum, every improvisation is a genuine Lehrndorfer. In 1957, he proved his mastery of the organ when he won first prize at the international ARD Competition sponsored by the German broadcasting network. In 1969 Lehrndorfer was appointed organist of the Munich Cathedral, the same year he became head of the Department of Organ and Catholic Liturgical Music at the Munich Conservatory. His renown and the resulting demand for his services as a teacher led him to found a School of Organ in Munich, which has since produced two generations of graduates. More than a few names wellknown to the music world may be counted among them. Lehrndorfer is a recognized master of the art of improvisation. His concerts both in Germany and abroad are invariably met with enthusiasm and admiration, and many of his performances have been preserved in recordings, including Celestial Christmas 5 (13090), The Concert (13109), Bach Reger (14200) and Theme & Variations, Vol. 1: Improvisations on Children's Songs (13208). 1 Maria, breit den Mantel aus. Variationen und Fuge 21'25"
2 Meditation und Ite, missa est 12'24"
3 Großer Gott, wir loben dich. Variationen und Fuge 15'02"
5 Symphonische Fantasie mit dem Österlichen Halleluja 17'12"